Strike Ball 2 is bigger, better and more fun than the original hit. Everything you enjoyed about the first game is back along with new features that will knock your socks off. The brick-busting fun for which Alawar is famous is just the beginning in Strike Ball 2. 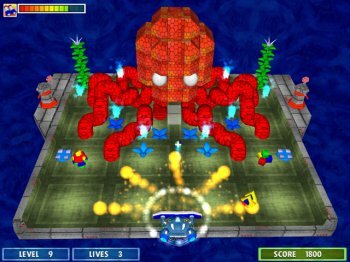 The makers of this new Arkanoid game have improved the visuals and crafted some amazing 3D levels. If you like Breakout games, Strike Ball 2 is a fairly good one and Strike Ball 3 is a much better one. Both games are available from Reflexive Arcade for $6.99.